A-Main placegetters were joined in Victory Lane by George Tatnell's wife Valerie, daughter Kelly and granddaughter Georgia. 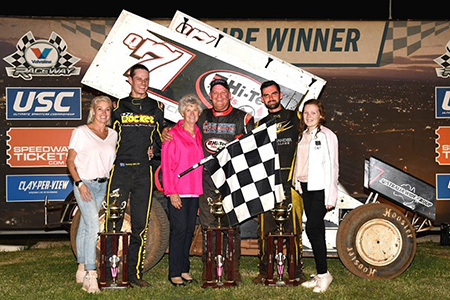 The Sprintcar feature was a good old fashioned dogfight between Farr, Sam Walsh and Alex Orr making it two fantastic USC main events in a row with last weekend at Murray Machining & Sheds Speedway Murray Bridge in SA also off the charts. For Farr it was vindication in Sydney to make up for the USC SA event where local hero Matt Egel stole the lead from him on the final lap. Alex Orr's fantastic season continues with his second podium finish of the season. Some points of note and personal season bests include Grant Tunks' top five, James Thompson back from illness with a solid top six and Daniel Cassidy's top ten result. Matt Jackson again proved that he is one of the hottest drivers in the country with another season win to score the GT Challenge victory ahead of a confidence boosting result for Nathan See in second and Matt Smith again right up in the order with third place. Once again 'the two Matts' were right up the pointy end of the field in what has been an amazing year for the pair so far. Some personal season bests on the night for the SSS GT Challenge included Troy Jenkins first top five in some time, Darren Jenkins running right behind his big brother for fifth, Speedcar rookie Glen Arnold finishing seventh, Sydney veteran Brett Morris dusting off the cobwebs for eighth in the normally Pickens steered King chassis, Moree's Jason Bell making a top ten debut for the season and Speedcar rookie Harley Smee breaking into the top ten for the first time at VR. Chris Marino took out the Street Stocker A-main event to lead home Shaun Davoodi in second place and Blake Eveleigh in third. A huge crowd turned out on "Ultimate Pink Night" to raise money and awareness for the National Breast Cancer Foundation in the annual affair held between sister tracks Murray Bridge, Parramatta and Toowoomba.